PBS’ current “Masterpiece Classic” series is set a century ago in London but has a strong Chicago connection. “Mr. Selfridge” is an eight-part series about the founder and founding of Selfridge & Co. in London. The program can be seen at 8pm Sundays on Channel 11, Chicago. PBS streams the series too, so you can catch up with most of the past episodes. Harry Gordon Selfridge, played by Chicago actor Jeremy Piven, was born and raised in Wisconsin. He came to Chicago in 1879 and worked for Field, Leiter & Co., became a director of Marshall Field and later manager of the State Street store. He sold his interest in Field’s in early 1904, bought the firm Schlesinger & Mayer (including the famous store building at State and Madison designed by Louis Sullivan) and renamed it H.G. Selfridge & Co. Selfridge sold that business to Carson, Pirie, Scott by the end of that year. Selfridge’s wife, Rose Buckingham, was part of a wealthy Chicago family. Her cousin, Kate Buckingham, funded the Buckingham Fountain on Chicago’s lakefront as a memorial to her brother Clarence. Selfridge apparently had the wanderlust because he looked toward London as a place to establish what he envisioned as a new kind of department store. He moved his family to London and opened Selfridge’s in 1909. He brought fashionable selling ideas from the US to what he considered a dreary London retail environment. Selfridge’s was a large and beautiful store where women were encouraged to shop for pleasure, not just necessity. They could view and even touch the merchandise, and lunch in elegant restaurants at modest prices. Selfridge also incorporated celebrities of the day, such as suffragettes, ballerinas and aviators, as part of exhibits and events in the store. 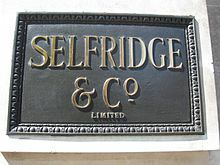 These themes about Selfridge’s retail vision are historically accurate, as are the portrayals of some of the characters. Chicago and Marshall Field’s are mentioned occasionally in the programs. There’s another Chicago connection to this retail story. Selfridge chose legendary Chicago architect Daniel H. Burnham to design his new London store. Burnham’s firm had also designed the original part of Marshall Field’s State Street store (the section at Wabash and Washington), now Macy’s, as well as Wanamaker’s in Philadelphia and Filene’s in Boston. Burnham was the impresario of the 1893 World’s Columbian Exposition in Chicago and an urban planner and builder who won commissions and built important buildings all over the country. Chicago played an important role in merchandising history; its central location as a railroad hub was a key factor. The two major catalog companies — Montgomery Ward & Co. (my alma mater) and Sears Roebuck and Company — were both formed here. Montgomery Ward was founded in 1872 by Aaron Montgomery Ward, who had the idea for a mail order business after his years as a traveling salesman. His travel in rural areas convinced him that rural residents wanted to buy goods but had no access to stores. Sears was founded as a mail order company in 1893 by Richard Warren Sears and Alvah Curtis Roebuck. Both later expanded to become chains of brick-and-mortar retail stores but Sears was more aggressive in its retail expansion and by the mid-20th century was much larger than Montgomery Ward. In the early 1980s, I worked in the public relations department at Montgomery Ward headquarters on Chicago Avenue near the river. The 26-story building completed in 1972 was designed by Minoru Yamasaki, the architect who designed the World Trade Center in New York. The Montgomery Ward complex at Chicago Avenue and the river also includes the original two-million-square-foot catalog house (1908) and a high-rise merchandise building. All three buildings are now repurposed as condominiums, restaurants and offices. Because of the long history of the company and its Chicago Avenue location, we were very conscious of the company’s place in Chicago history. The PR department storage closet was filled with old papers, publications, photographs and other memorabilia, in addition to the even larger trove in the corporate library. One day a colleague and I were looking for something from the past and found a large, unsealed envelope on a shelf. We opened it and found a copy of a 1944 letter from President Franklin Roosevelt to chairman Sewell Avery, ordering him to allow union representation for employees and ensure the delivery of essential goods. 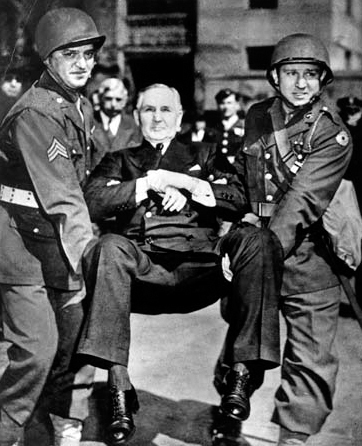 Avery refused to sign the contract and two National Guard men removed him from his office, as shown in this famous AP photo of the time. Note: A shorter version of this article appeared on gapersblock.com.